Helm is the package manager for Kubernetes, you can think it as yum/apt/homebrew. It contains two parts: Server (tiller) and Client (helm). helm client can be installed on Linux/Mac/Windows, the package can be found here. Helm manages the Kubernetes charts which are pre-configured Kubernetes resources. In the following example, I will show you how to install Prometheus by using helm. Install Prometheus and configure the ingress for the services. 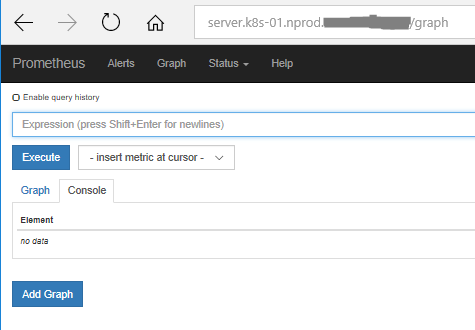 I use the Kubernetes cluster that is built by kops, and I will continue use the example domain k8s-01.nprod.my.com. Please change it accordingly. Add alias records in Route 53 for server.k8s-01.nprod.my.com and other services to point to ELB. Then test it, you should see the Prometheus page.